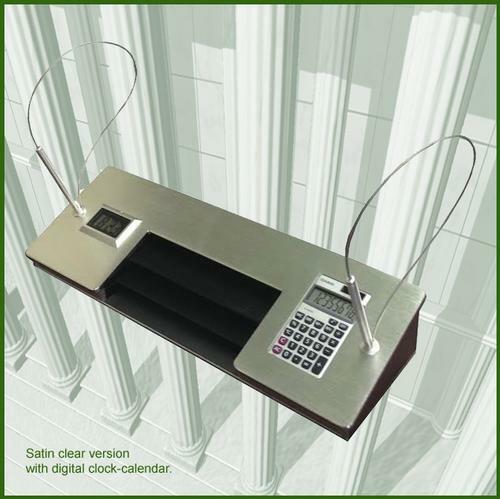 Our Montecito line, single-sided check stand center piece has two security pens on cables, a calculator, a center form holder, and your choice of either a digital clock-calendar or a magnetic perpetual calendar. Available in three anodized aluminum finishes: satin clear, satin black or satin brass. Center piece is constructed of 1/4" aluminum built to survive heavy usage for years to come. Center section is a 3-pocket form holder 8-1/2" wide. Optional FDIC or NCUA emblems may be added. Underside base options are non-slip cork or double coated adhesive. Dimensions: 7"D x 22" L.
This high-style, single-sided check stand center piece has two pens on substantial cables and a calculator. It comes in a choice of a digital clock-calendar or a magnetic perpetual calendar. It is available in a choice of three finishes: satin clear, satin black or satin brass.